We leave the Oscellucia in the afternoon of July 11th, heading to the Agriates desert, in NW of Corsica. The forecasts let us expect a total lack of wind, but happily, we manage to reach a good 5 knots speed average after hoisting the spinnaker. 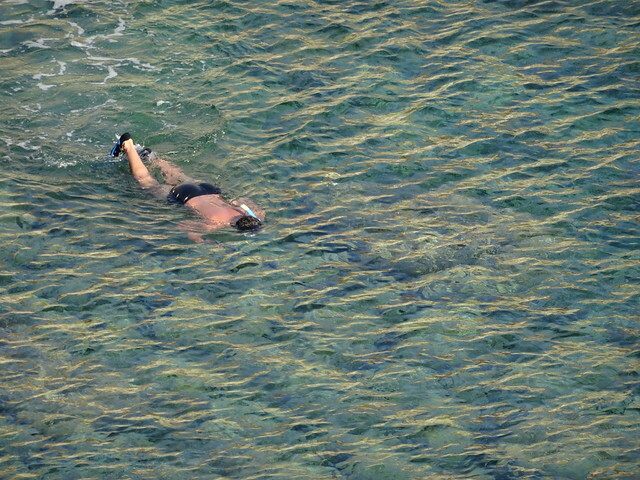 Once arrived, we start snorkeling as usual to cool down a litlle bit but avoid the jellyfishs. 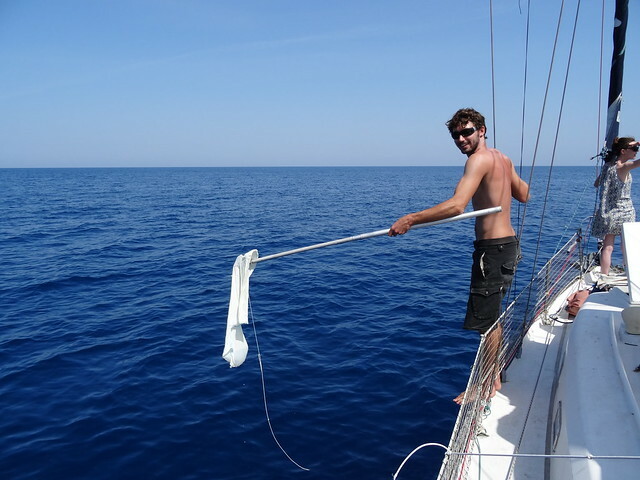 Adrien will discover a strange and unusual fish : a 15m long achoring chain in very good shape. No need for it on Karukera : we decide to give it to our neighbours, which only have 8 m of chain ! Our litlle walk in the desert wild land will let us see a few wild cows. We will leave them alone quickly when a big bull will appear in the middle of the « maquis » ! The next morning, we head to Capraia, the first beautiful Toscana Island. Having to turn the Cap Corsica, we have to sail against the wind, but hopefully the wind will slowly turn, letting us getting there without having to tack. 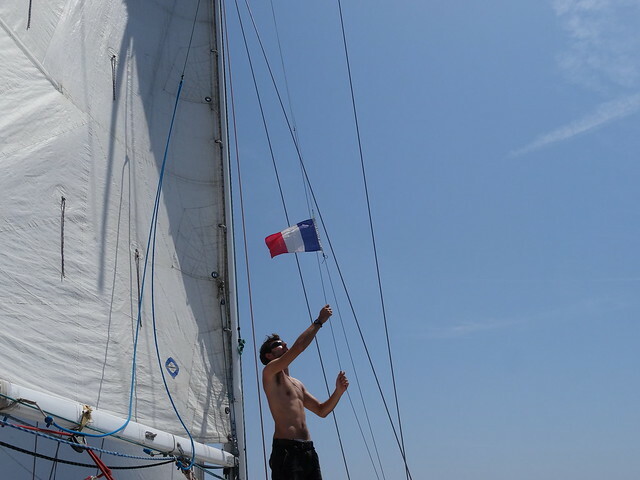 Once at the Cape Corsica, we have to start the engine : the wind will unfortunately stop ! We wait there a few hours, go snorkeling for a while, and then the wind comes back from the good direction ! 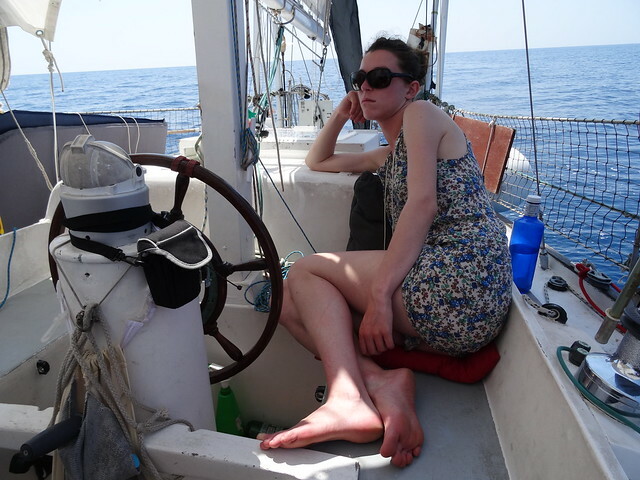 we will sail to Capraia, and arrive around one in the morning. On the next day, we go on a hike on this wonderful Islands, wild and preserved from turists ! 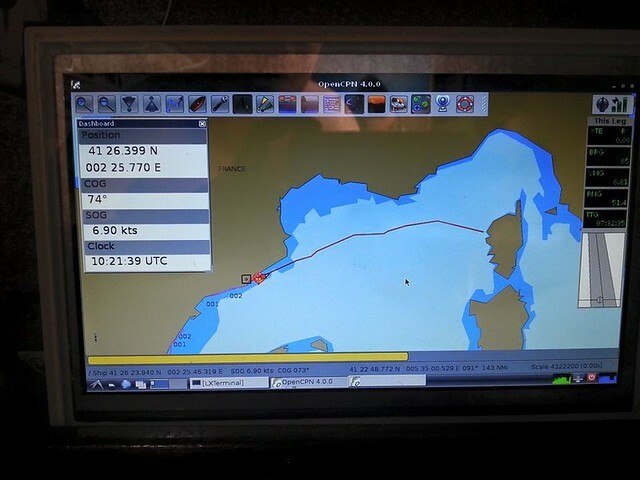 We head to Elba without any wind : 30 miles with the engine under a hot sun are not the « sailing » conditions we like the most ! We take advantage of this boring day to design and 3D print the piece of plastic that turns the engine off. The original piece was partly broken, and each time we wanted to turn the engine off, harming our hands was a bit necessary ! The new piece is softer for them, and will work tremendously well ! On Elba, we will stop in Marciana marina, a nice port in the NW of the Island. 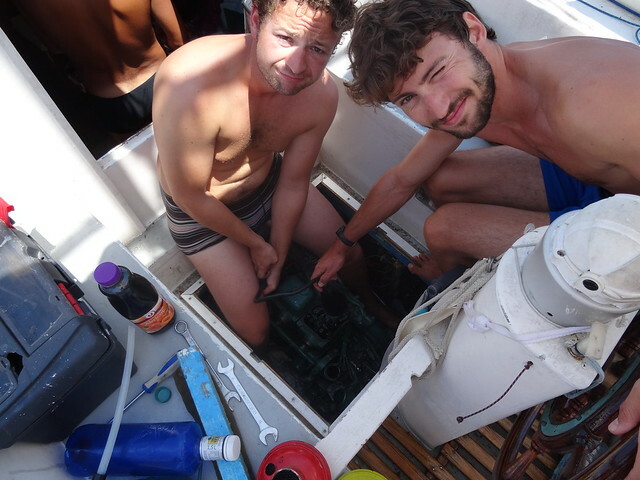 The next morning, an unfortunate surprise is waiting for us : the engine won’t start ! So far, we had been experimenting absolutely no problem with it ! After a little investigation, we discover that the exhaustion gaz are exhausted in the admission, on the wrong side ! Why ? After a few repairing trials, we change all the lubrification oil that got spoiled from exhaustion wastes. We finally call our mechanics partner Gwen marine (www.gwenmarinevolvopenta.com), who gives us tips by phone. He suggests that the exhaustion pipe is clogged somewhere. We will discover an important quantity of carbonised waste, that were effectively blocking the pipe… After a methodic cleaning of the different pieces, we start the engine. He will start immediatly, which we weren’t prepared to ! A black cloud of smoke will project soot all over Adrien, that will have to wash for a long time before being clean again ! With the engine working, we leave to the next island : Giglio. 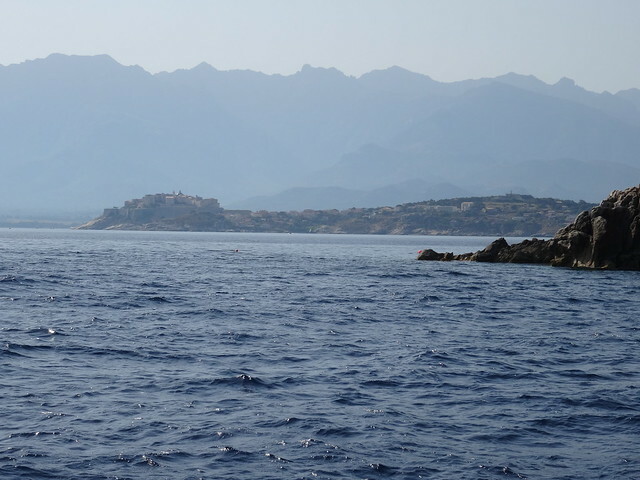 This is the island where the Costia Concordia sunk a little less than a year ago. Entering on the accident site is forbidden, but we will still see a few cranes in action. On the next morning, we go to visit the castle at the top of the islands, offering a wonderful view ! Afterward, we head to the last of Toscana islands : Giannutri. Only 2 miles long, this island is actually the remains of an old volcano’s crater who collapsed ! Whil approaching the island in the end of this sunday afternoon, we see a huge number of motor boat leaving ! Thanksfully, because when we will arrive, there is still not so much space to put the anchor ! We can only imagine how crowded it was earlier in the week end ! On the next morning, we head to Riva di Traino, our first stopover on the Italian coast, not so far from Roma. Once again, there is absolutely no wind : 100% of the crossing with the engine… And guess what, we will be short of fuel in the middle of the ocean. We have two jerrycans of gasoil that will allow us to refill, and re-pressure the engine. After a ten minutes immobile, everything is back in order. Exept Yahia’s flip-flop : we have a FOB (flip flop over board). A good situation for an exercise. Don’t worry, it’s safe, and not to frightened ! Approaching Roma, we need to choose the harbour offering a good compromise between proximity of the capital vs price : here one night in a harbour can sometime cost 50 € !!! Barcelona-Corsica: delightful crossing and sea animals festival! 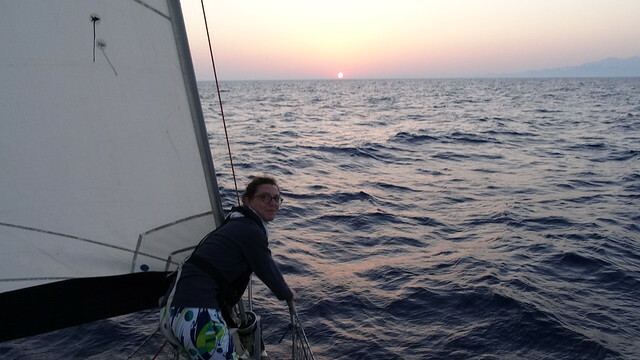 We leave Barcelona Sunday the fifth of July with a good favourable wind coming. 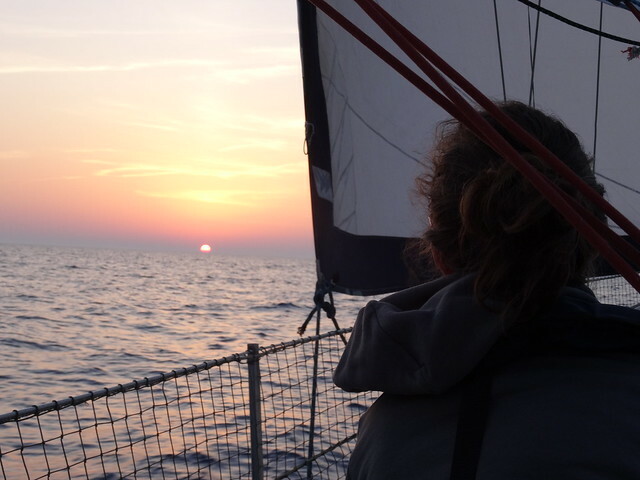 We will be sailing at 7 knots along the Costa Brava until the sunset. 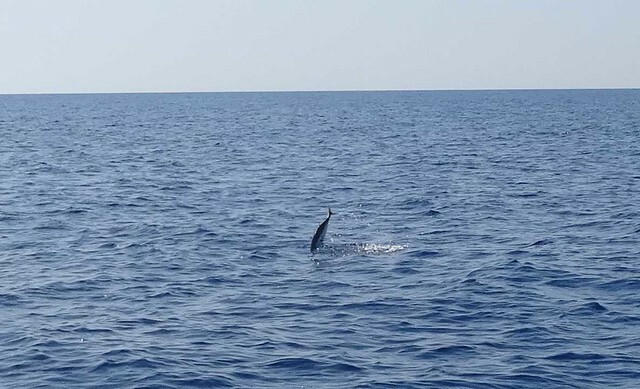 Dolphins allowed us to leave the spanish coast with a smile on our face! They stay 30 minutes playing and jumping around the boat. A gale force wind is expected to blow over the Mediterranean sea a few days later, and we have to reach Corsica before it does. But the wind will abandon us in the evening of the first day. We are worried about it because the weather forecast predicted good wind during the two first days. The third day should be a day without wind and the fourth day the arrival of the strong wind. We turn the engine on for some long hours, the wind won’t come back for all the night. We manage to sail one little hour during the morning but the little breeze disappears and the « sweet » engine noise come back again. During the second day, the mood is not here for Karukera’s crew. Living with the permanent noise of the engine is hard for the moral. We read, we try to rest as long as we can to avoid boring aboard. Fishing still doesn’t work, even with all our motivation. We would want to stop the engine for some hours, jump in the sea and enjoy the silent of the ocean but it is not possible because of the strong gale expected two days later. And…the wind comes back in the end of the second day: the opposite of the weather forecast’s prediction. 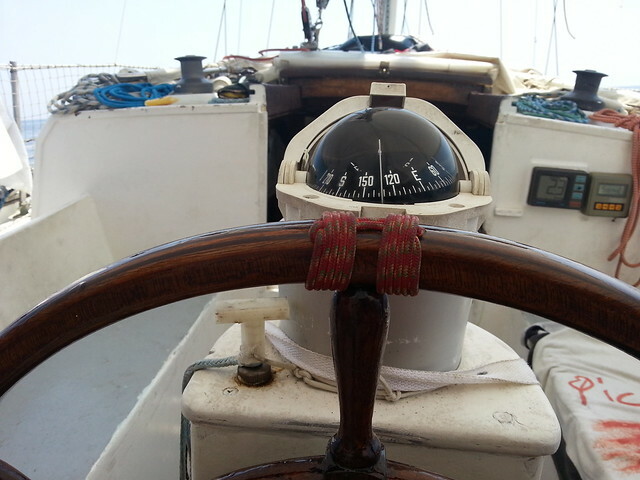 Anyway, we are sailing at 4 knots without the tedious noise! Happiness comes back aboard: the second night is amazing. The sea is calm, very comfortable with a breeze just as we want it to be, not too gentle and not too strong. 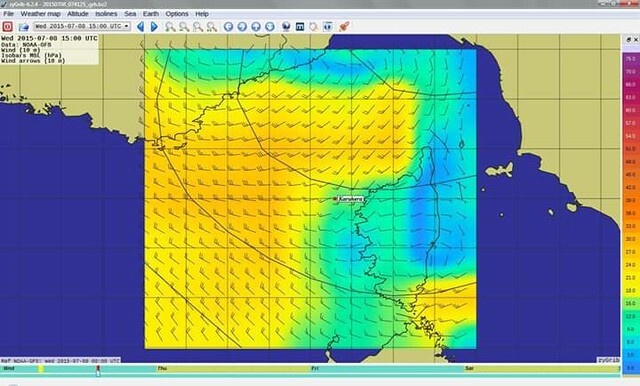 We will be able to sail at 6 knots at some moment. We go through a bloom of phosphorescent plankton and we also see phosphorescent jellyfish. Under a sky full of stars and without the moon, the show is magical. In the morning of the third day, the wind is still here! The half of the crossing is done and we put the French colour on. After two months out of our country, it sounds strange to be back in France, it will be too easy to speak with other people. We enter the pelagic natural reserve where a lot of marine mammals are often observed: we won’t miss them! After having seen some dolphins playing near the hull, we see two whales 100 meters away from the boat. They disappear under the water as fast as they appear and we are not speed enough to take a picture of them. After that, the tunas will start to make the show. They jump around the boat, stay near the surface very close to the boat. At this moment, we want only one thing: fish one (or two/three/five…) of them. We put three towing lines behind the boat but fishing is apparently not our vocation: we won’t fish any of them. In the middle of this natural reserve, we are shocked to see so many floating plastic. Plastic bags, polystyrene foams, helium balloons… We take those under our way but they are too many. The last night will be short! We heard a weather forecast at the radio: the gale should arrive sooner than expected. It will also be stronger than expected. Thanks to our satellite beacon, we talk with Leo and he confirms us the bad news. At 4 a.m the wind begins to blow stronger, we keep all the sail out in order to maintain as much distance as we can from the real strong wind. Just before the sunrise, the Corsica mountains appear and one last time the dolphins come and play around the boat. 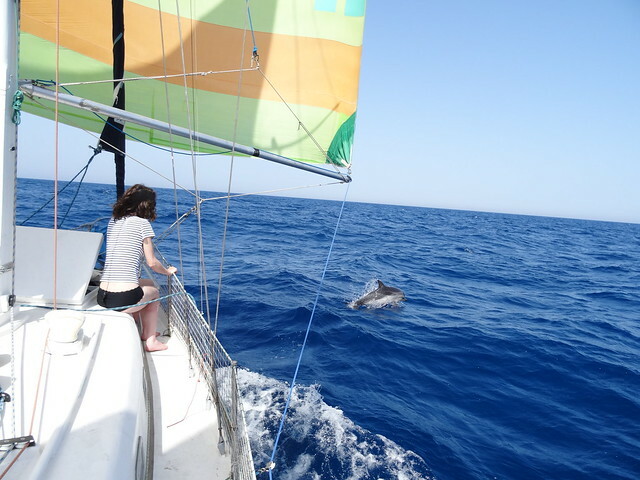 We are sailing at 7 knots, we like that and the dolphins too. With all those events, we forget to sleep but that is not important. In 4 hours we will be arrived. 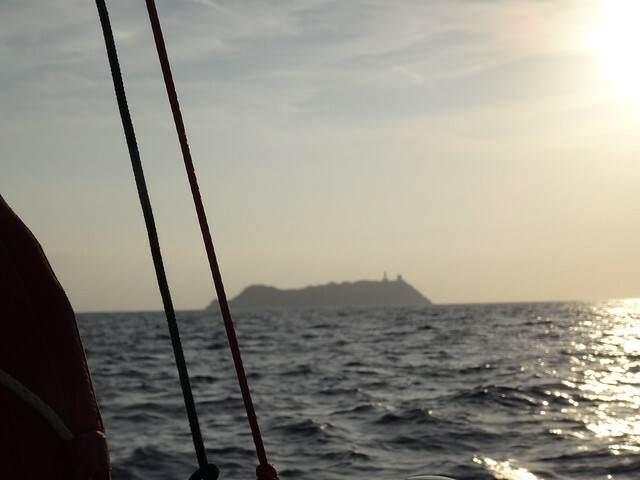 We are going straight to Calvi bay, it is a good shelter from the SW wind. By crossing the punta Revellatta, we discover the citadel of the ancient city. But the shelter that we had chosen (Oscellucia) is not as good as we thought; Even if the wind is coming from the earth, it is too strong for the anchor (until 45 knots). We can’t stay here. 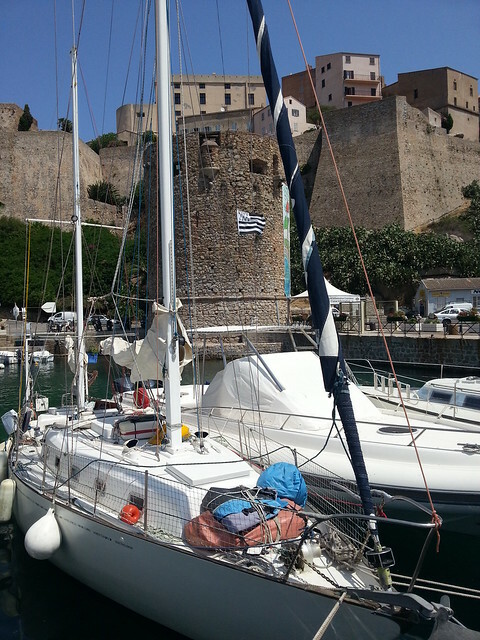 All the boat are moving to the marina of Calvi and we do as well. The summer season has begun and it is difficult to find a place in the marina but thankfully we find a place in the fisher’s harbour. It is 1 p.m and we are walking on the ground. We will spend the rest of the afternoon sleeping. The day after, the wind blows more gently. 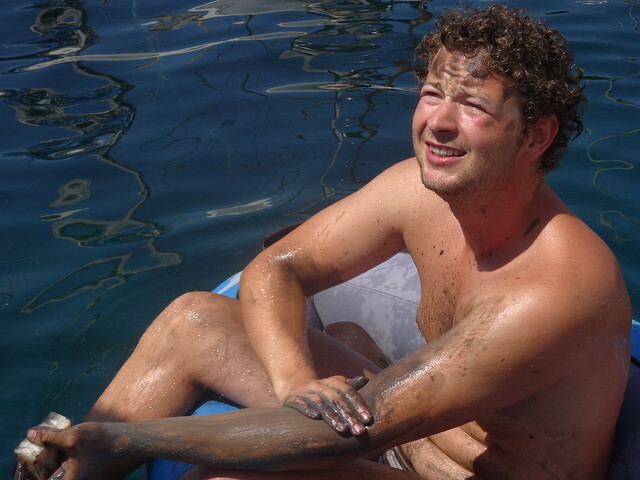 We leave the marina and go to a small shelter from the E wind named Port Vechio where we go snorkelling. 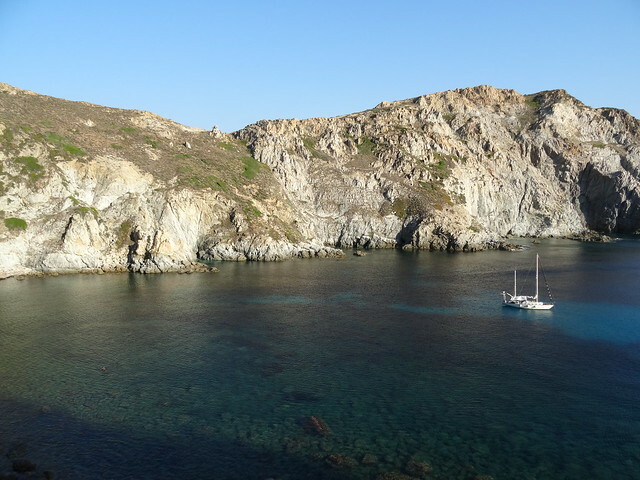 There we enjoyed the sea and the beautiful Corsica landscape before moving to the next stopover: Capraia, one of the beautiful Toscana islands.